This winter has drug on. Is it just me? Or most of us? Or us of all? I grew up in Wisconsin winters; I should be used to this, but this one, it’s wore me down. It’s finally spring, and we still have threats of snow tomorrow. I spent the cold months wandering the house aimlessly. Yearning for sunshine, horse hair or fresh air, or chocolate. Just something. Nothing soothes. Nothing satisfies. My usual desires don’t satiate. A favorite dog-eared novel in front of the warm fire feels just sort of ho-hum. A good bath is too hot and leaves me with a headache. My camera doesn’t call to me, yoga feels tiring instead of the usual invigorating. I should be writing a story; my editors are waiting, but the story isn’t exciting me. My pretty little house has things strewn everywhere, a stack of dishes in the sink, laundry to be folded. I’m not really a mama bear. Sort of just a bear. My two little boys that I love so dearly are forever underfoot and noisy little turkeys. They yearn to run and jump and buck and yell. They aren’t meant to be corralled. My husband is grumpy; he’s tired of being cold. And as I wandered the house Monday. Knowing I should work or clean or something. 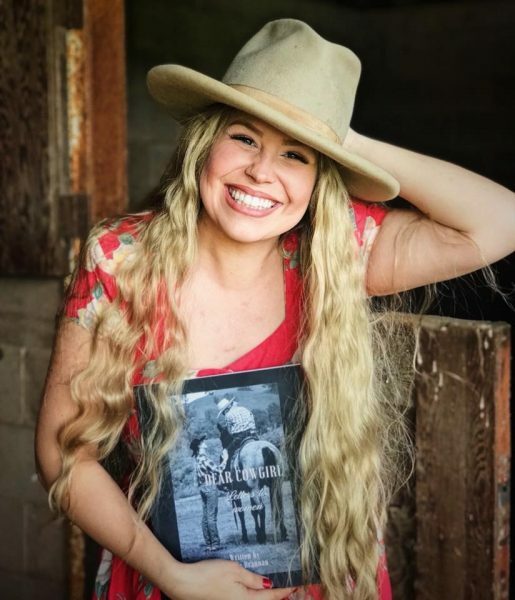 I picked up my copy of “Dear Cowgirl” by Adrian Brannan. A little fire lit in my belly. My boys were just laying down for a nap, so I snuck down the stairs to my pretty basement bathroom and filled my jetted-tub with the perfect temperature water, dumped in my homemade essential oil salts, smeared a mask on my face and conditioner in my hair. I sunk down into the bubbles, and I read. I read the whole thing as my bath grew a little chilly. I soaked in the words, and they ran like balm over my heart. She has it. Adrian knows. She can say what I think, or what I lack, or what I feel or hope to feel. It was only an afternoon, or not even. Just an hour or so, but I felt a little peace in my heart like a Sunday morning spent in church listening to a sermon with God’s words being spoken just for you. After their nap, I set my kids up with an activity, cleaned my kitchen, made a soul-food dinner, and felt better. About life, about winter, about me. My early-spring blues will likely creep back in, sneak up on me, my kids will hit that last nerve, but today I feel good. I feel like me. I can only imagine the women of this world who would benefit so deeply from hearing Adrian’s wise words. What a gift this would be from a husband to his wife, a mother to her daughter, a friend to a friend. Mother’s day is approaching, though it doesn’t feel as though spring is anywhere near, and this would be a lovely thing to give with flowers or chocolate. Adrian says everything you may not be able to put into words. Can you imagine reading a “Dear Cowgirl” each morning as you drink your coffee, or if you’re like Adrian, your morning brew? Meet a group of women for coffee each week or each month and share two or three “Dear Cowgirls”. Match a telling bible verse with that day’s “Dear Cowgirl.” Read it all in one sitting as I have done. Gobble it up, or languish it. Either way, read it. Please. They’re words you need to hear. Especially during this never-ending winter. 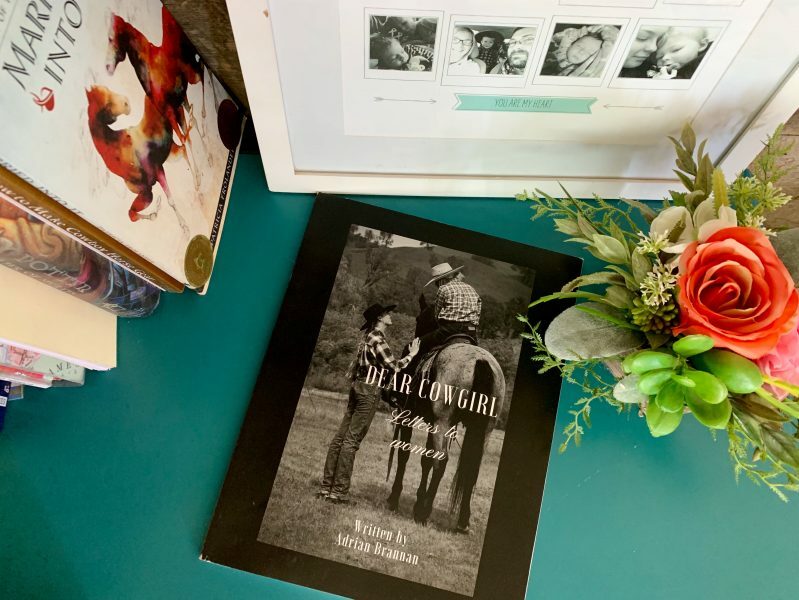 Adrian Brannan’s “Dear Cowgirl” is flanked by some lovely year-round florals arranged by our mutual friend Jessica Casteel at Tapadero Annie’s. This is a letter for the ranch wives. The ones who can pull a calf and wrangle kids, get rowdy babies saddled up for the day and handle a skittish colt. For the women who have learned how to feed as the baby steers the truck, and give up on the concept of perfectly clean floors at any time of the year. To the women who sit in that damn tractor cab for hours on end, put up hay, and giggle at the animals found and quietly wipe away a tear at the ones who don’t run. For the women who arm themselves with a .45 and a juice bottle for when there is a tragedy, no matter what kind. For the women who fix the tears and holes in worn Levis and Wranglers, and know when to put their foot down and when to offer a hug and smile. For the women who came from ranching families, the ones who came from town, and the ones born on the back of a rope horse. For the women who rope every chance they get and choose a cotton glove over manicures, or who never pick up a rope and shine at working the ground. For the late-night dinners eaten hastily, the branding pen crockpots in truck beds, and mud pies made in the driveway with dirty, summer-tanned ranch kids, excited for the longer days. For the times the damn truck gets stuck, the times you lose the heifer or fail to turn back a cow. For the times your loop settles perfectly and when he smiles at you across the truck, or for that one colt who drops his head. To the women of the ranch, the women of the home, and the women of the hearth. Dear cowgirl, your role is not forgotten and your worth is not unnoticed. 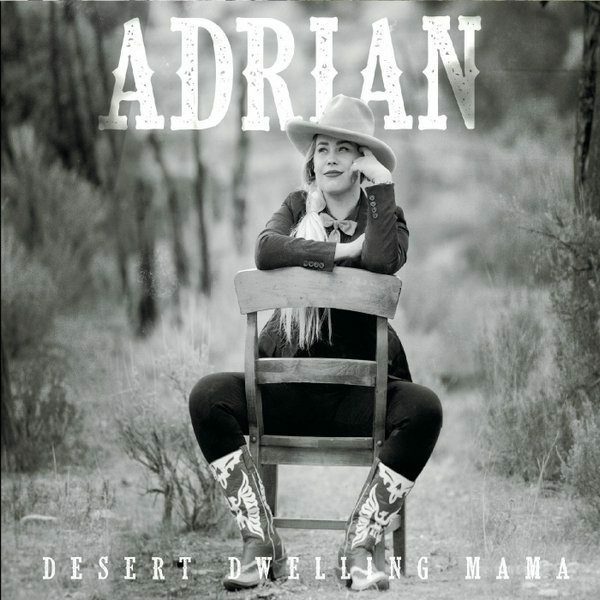 Get your copy of “Dear Cowgirl” here and get Adrian’s new album Desert Dwelling Mama just released Jan. 31 here. Comment below to enter the giveaway for Adrian’s book! Tell us, who in your life would love this book?